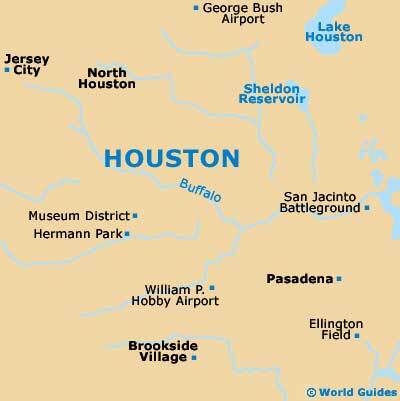 Just over an hour away from the popular coastal city of Galveston, Houston is a sprawling city with good highway connections. In fact, Houston has grown at such a rate that it now ranks amongst North America's largest, with its metro area boasting a population exceeding six million. As a result of its size and plentiful zones, visitors can be assured of a multicultural experience when vacationing here. Many come to learn all about the solar system at the Space Center, while other tourists appreciate the cluster of quality cultural attractions that combine to make up the Museum District. Worth noting, most of the best museums are situated on the northern side of Hermann Park. Below you will see a list of useful Houston links, collected to help with travel plans. Greater Houston Convention and Visitors Bureau - Official Website - 1331 Lamar Street. The Menil Collection - 1533 Sul Ross Street. Museum of Fine Arts (MOFA) - 1001 Bissonnet Street. Houston Museum of Natural Science - 5555 Hermann Park Drive. Discovery Green - 1500 McKinney Street. Hermann Park Conservancy - 6201-A Hermann Park Drive. Children's Museum - 1500 Binz Street. Houston Livestock Show and Rodeo - Reliant Center, 8334 Fannin Street. Houston Zoo - 6200 Hermann Park Drive. Orange Show Center for Visionary Art - 2402 Munger Street. Space Center Houston - 1601 NASA Parkway. Houston International Hostel - 5302 Crawford Street. Crowne Plaza Houston Downtown - 1700 Smith Street. Crowne Plaza Houston Northwest - Brookhollow - 12801 Northwest Freeway. Hotel Derek - 2525 West Loop South. La Colombe d'Or Hotel - 3410 Montrose Boulevard. Hyatt Regency Houston - 1200 Louisiana Street. Alden Houston - 1117 Prairie Street. The Lancaster - 701 Texas Street. Robin's Nest Bed and Breakfast Inn (Pet Friendly) - Corner of Greeley Street and West Main Street. Hotel ICON - 220 Main Street. Hotel Indigo Houston at The Galleria - 5160 Hidalgo Street. Hotel Granduca - 1080 Uptown Park Boulevard. George Bush Intercontinental Airport - 2800 North Terminal Road. William P. Hobby Airport - 7800 Airport Boulevard. West Houston Airport - 18000 Groschke Road. Ellington Airport - 11900 Galveston Road, Dixie Farm Road. Sugar Land Regional Airport - 12888B Highway 6 South, Sugar Land. Houston Southwest Airport - 503 McKeever Road, Arcola. Yellow Cab - Greater Houston Transportation Company, 1406 Hays Street. Space Town Transportation and Limousine Services - 3702 Arc Street. Utopia Limousine Services - 9101 Lipan Road. Buffalo Bayou Shuttle Service - 5868 A1 Westheimer Road. Ride Metro - Metropolitan Transit Authority of Harris County - 1900 Main Street.